I usually keep my blog focused on jewelry making activities – creativity, my classes, tips and projects, and the business side. But today, I’m doing a quick write up about some changes going on. It has been extremely difficult to realize that as much as I love creating, designing, and teaching classes, jewelry making is not a way for me to make a living. Even though I no longer live the style I used to as a corporate manager, I still need to pay the bills and feel comfortable financially, so I had to shift gears a bit, and look elsewhere. What a Very Cool View! A few weeks ago, I took a trip to Florida for a class I took (so nice to be a student for a change! 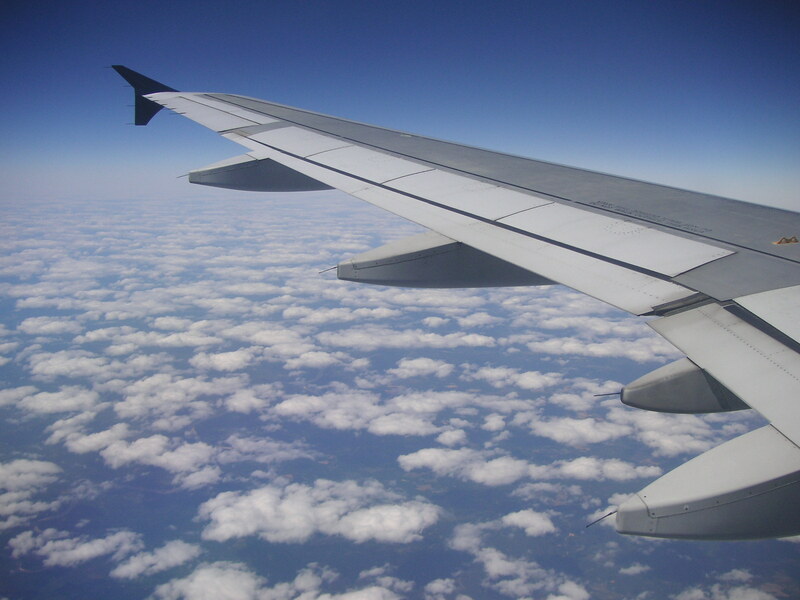 ), and this was the view from my seat… I love this picture! The class wasn’t about jewelry making – it was for a totally different business venture of mine that I have been involved in for the past 6 months, which is about to be launched. In about 2 weeks, I will be opening up a store (brick and mortar), called “Big Frog Custom T-Shirts & More of Mountain View” and I was in Florida to attend my business training at FrogU (really!). I had been looking at franchises for a while. I had a pretty extensive list of what I wanted, and after a few years of looking, the Big Frog franchise opportunity got before my eyes. It pretty much meets the key elements of what I was looking for in both a franchisor, and a business – a fun place, focused on customers, with potential to use both my creativity and my marking backround. So… I jumped into the pond, and I am now a Big Frog! This is why I’ve been posting sporadically… I’ve always wanted StudioDax to remain mostly focused on jewelry – not my personal life, and not my Big Frog activities. 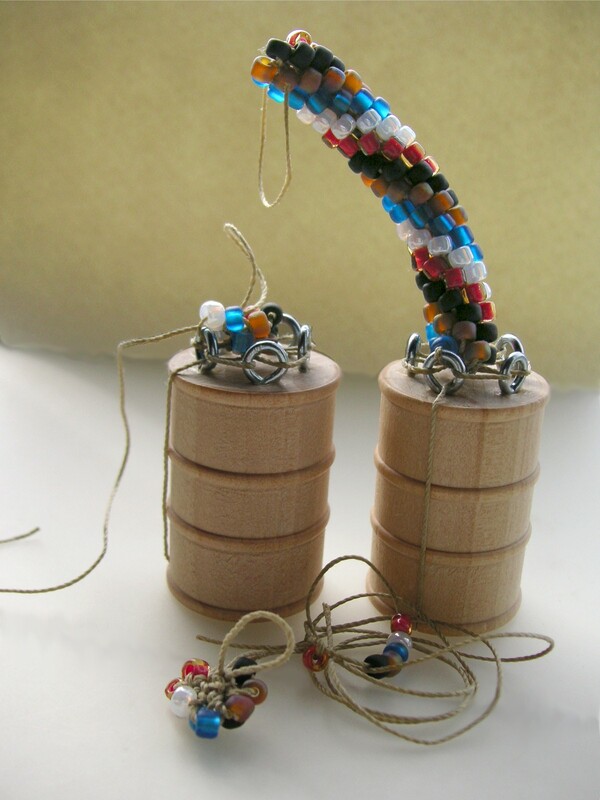 Like so many others, I started StudioDax as a natural extension of my jewelry making hobby. 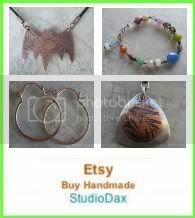 StudioDax will continue – I will maintain my StudioDax Shop on Etsy, where I will continue selling some of my jewelry, some great jewelry tools, and of course my bead crochet Jig/Tutorial. I will continue developing and creating new designs because I love to design jewelry!! AND – I will continue to post here on my blog, keeping the focus on things that the jewelry community will be interested in Although it is no longer the way I make a living, it is still a big part of who I am! If you are interested in seeing what has been my focus for the past few months, you can check out my Facebook page for Big Frog of Mountain View. And I promise – my next post will be on something bling bling! I can’t believe I am still coughing, and still lightheaded. It might have turned to bronchitis. I haven’t gone out in almost 2 weeks, and I even had to cancel a class, which I really hate to do. No matter what, I have to go out tomorrow (gotta see the tax guy – can’t put it off! ), but I’m having my sister drive me, because I’m still feeling pretty fuzzy . Before I got sick, I took photos for my next “Tools that Delight” posting, and I will try very hard to get to it this week. But right now, I’m taking some Nyquil, and heading back to sleep… zzzzzzzz….. 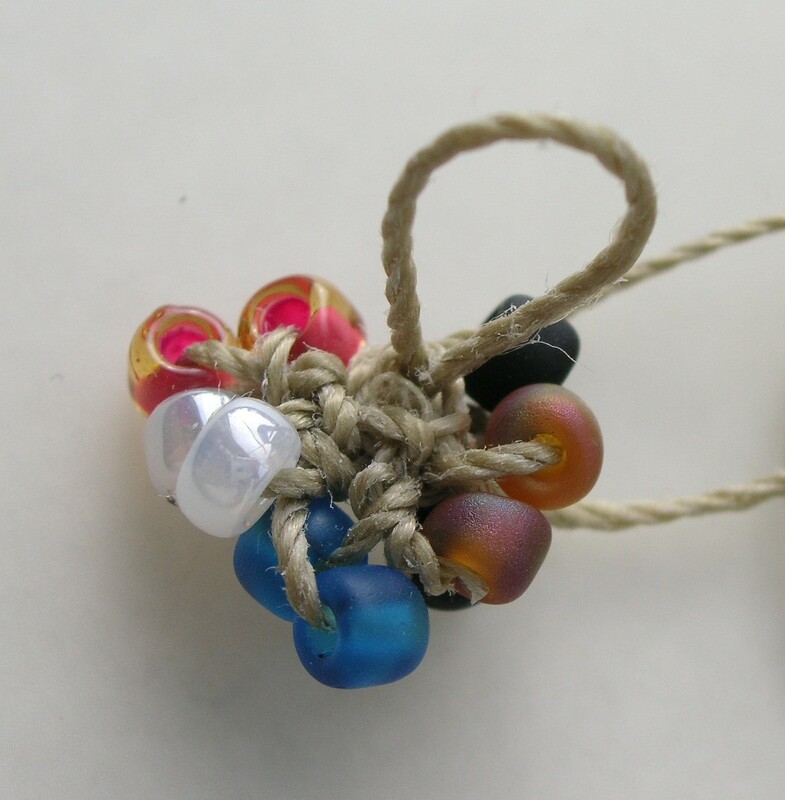 When I learned to make bead crochet ropes a few years ago, I found it to be beyond frustrating! In my class, the instructor (Stephanie Riger – a wonderful jewelry designer and friend), made it look so easy… but I was totally unable to create the starting base rows. I was not the only one – Stephanie is a great teacher, but she had to create the first few rows for many of us. Once started, it took a while to learn the technique, but I didn’t find it too difficult to learn the basics, and now I can zip thru it! But the first few rows continued to be difficult – alot of rework, much frustration, and ripping out the first few rows. When I was asked to teach classes in bead crochet, I knew there had to be a better way to make the first few rows, so that it was easier and faster to get to the fun part!! So I did a lot of experimenting and prototyping, and finally came up with the Starter Jig. So why is it so frustrating to start bead crochet ropes?? 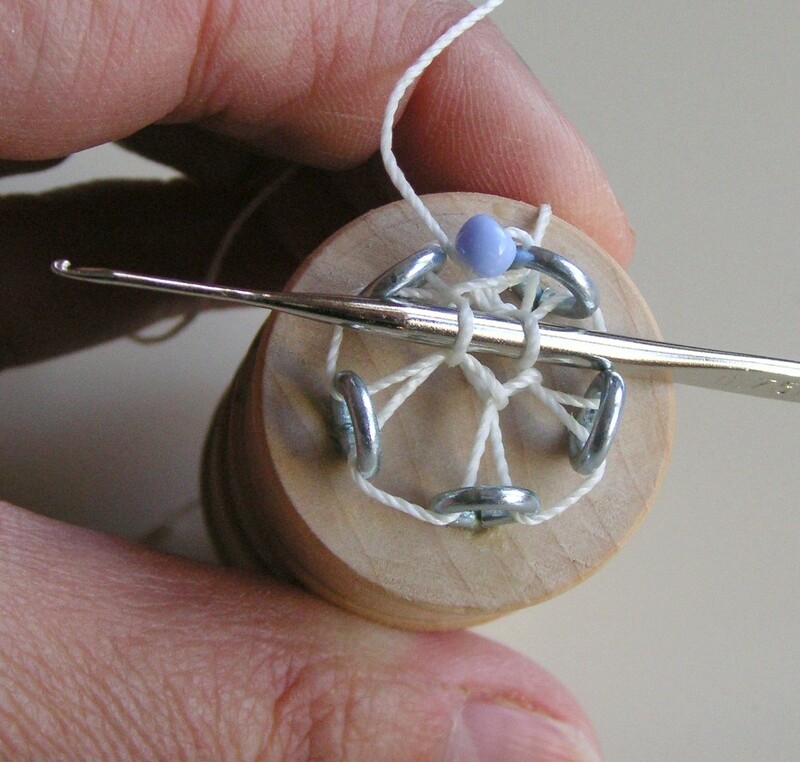 Just look at it… to start, you crochet a ring of beads, and then add stitches thru the ring. This is 2 rows of bead crochet rope (5 beads around), done in size 6 beads. It can be difficult to tell where you would put the crochet hook, and where the next stitch should be, especially for someone learning. Although I tried to straighten it out for the photo, this is a real mess of thread and beads. So how does the jig help…? 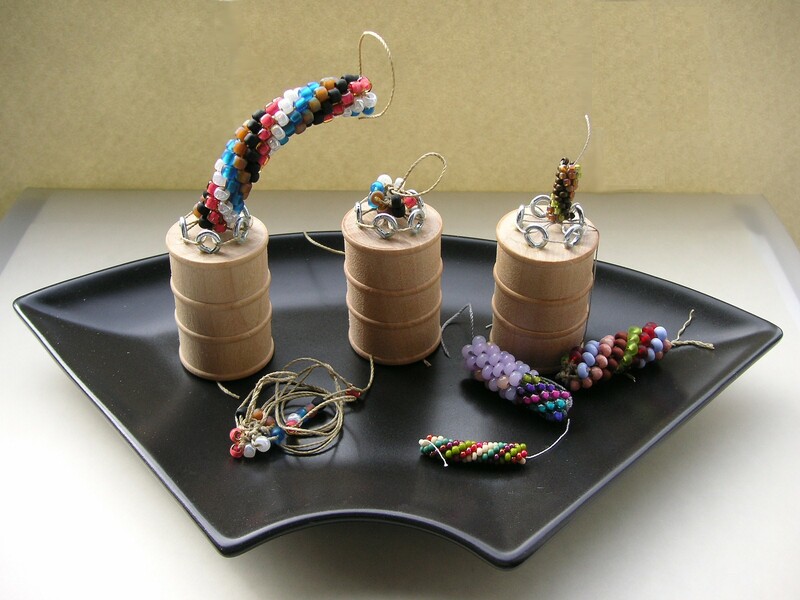 Creating bead crochet ropes is the same technique, whether you use the Starter Jig or manually create a starter ring. It’s the first few rows that are so frustrating, because there is no structure. Using the Starter Jig, you are able to easily stabilize the first few rows, so that you can position the crochet hook, and add stitches in the correct orientation. Once you have about 2 inches of beads, you remove the jig, and continue crocheting and finishing off your project. In this photo, you can compare what 2 rows looks like when on the Starter Jig, or when done in a manual bead ring. For reference, I also show the same pattern of beads after about 2 inches – if this was a “real” project, the rope would be ready to be removed from the jig. When I go to shows and events, I am able to demo the jig, showing customers the benefits: it’s easy to use, the starting rows are stable, and when you remove the jig, the starting rows are clean and neat (no more ripping out starter rows!). But I can’t always be there, so I created a mini display with a few pieces in process. 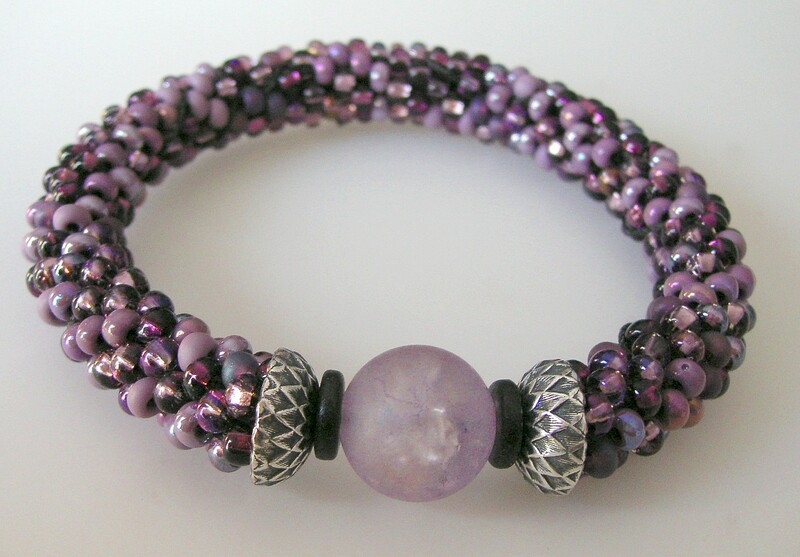 I make most of my bracelets in size 6 beads, but I also like using size 8’s which are a bit smaller. 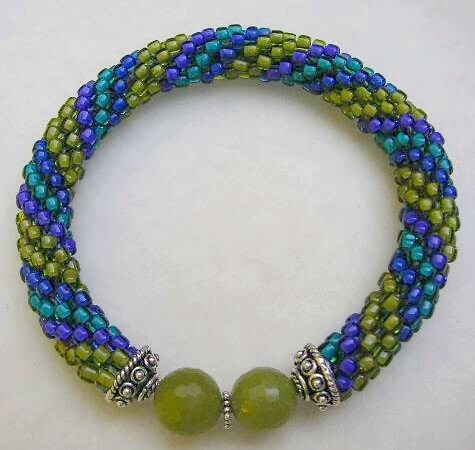 This bracelet has been a favorite of mine, even though I no longer have it… the beads are vibrant, and the center focals and silver endcaps accent the pattern beautifully. If you’re interested in buying a jig (it comes with an emailed 20+ page pdf tutorial, with over 50 photos), please CLICK HERE to visit my Etsy store (or you can click on my Etsy menu, in the right side), and check out the section on tools. A Little Bling Goes A Long Way…. It can be tricky to combine the sparkle of crystal with stark metalwork, but if you keep the design sleek and simple, then the materials work together really well. Back in September, I taught a class at Hooked on Wire, and attended a presentation from the Swarovski folks… I got loads of little crystal bits (see my previous post on this HERE), and finally got around to creating a new design, which I really love! Isn’t this a great look!?! I cut a simple triangle from some scrap silver sheet I had, rounded the edges and the corners, and used a combination of files, sanding blocks, and polishing papers to get the soft finish. I then drilled a hole so I could add the crystal (the crystal comes pre-set in the rivet setting). 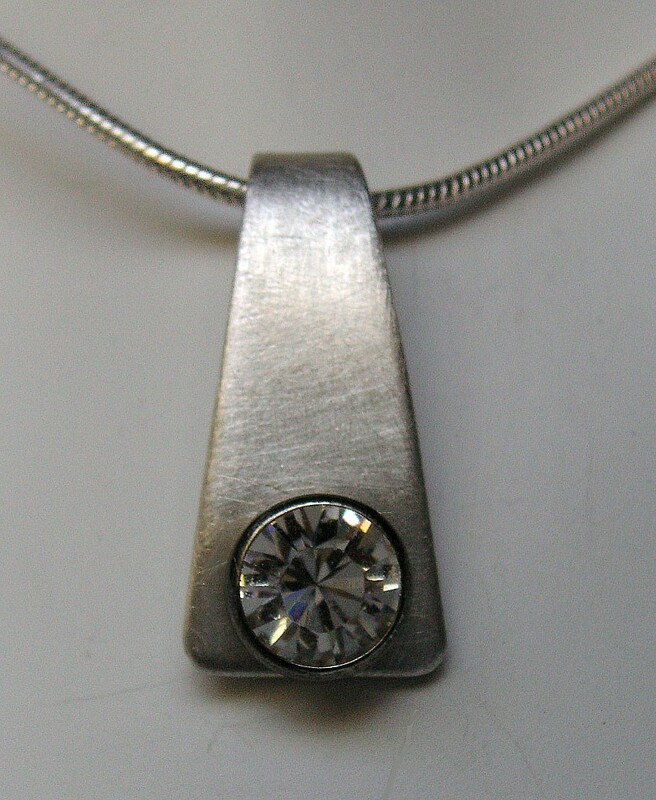 From the side view, you can see a bit more detail – when I drilled the hole for the crystal setting, I beveled the edge of the hole to accommodate the angle and allow the cup to seat into the silver. 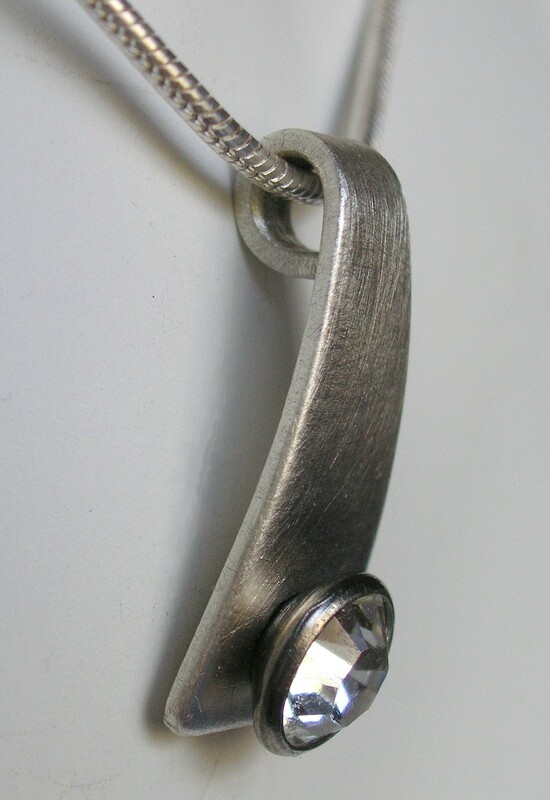 I curved the silver lightly to balance the formed bale – the minimalist shape provides a graceful way to hang the pendant on a chain. Best Not Seen... The Back! The back looks a bit messier than it really is… the tube (rivet) was quite long, so I had to cut it’s length, and then cut down the tube to create tabs to fasten it to the silver. 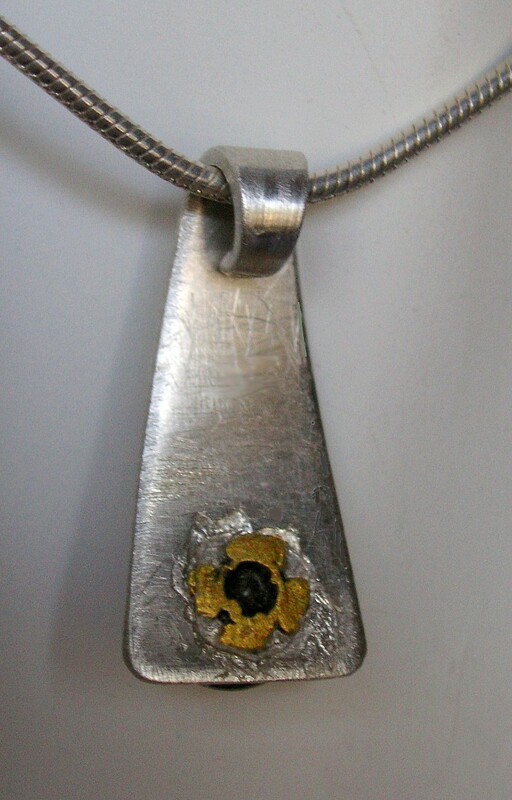 Since the rivet is brass, I was concerned that if I manipulated it too much, it would become brittle and crack. So I simply hammered the tabs down, and added a blob of E6000 to cover the tab edges so they don’t catch or scratch (E6000 is a thick adhesive). 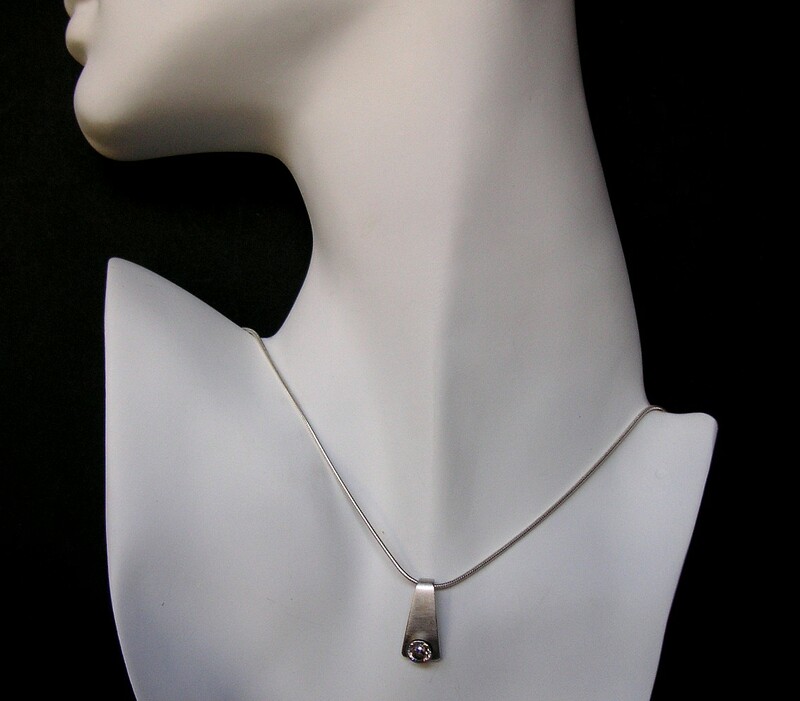 I love how this pendant looks – right at the collarbone, showing on the skin. The crystal makes it pop, and with the matte finish on the silver, this is a piece that looks great jeans and a sweater, or all dressed up – since it’s Swarovski, the quality crystal sparkles however you wear it! I gave this one to a friend as a thank you gift, but I’ll be making a few more, maybe even with different shapes, but the same styling. I just love when the end result looks better than what I imagined! I love being an independent jewelery designer. I love to design pieces and make jewelry – bending wire, hammering metal, playing with fire… it is so satisfying to indulge in chaos, and to just create. I can lose myself for hours reading my jewelry technique books, and I always keep a notebook with me so I can jot down my latest ideas when inspiration hits. I am a tool junkie of the worst (best?) kind – I covet all the latest new jewelry tools, and prowl the aisles of Harbor Freight and Home Depot, thinking of creative ways to adapt all their tools to suit my jewelry making. And I love to teach too… I was “drafted” as a teacher many years ago, and surprisingly, I discovered I enjoyed it alot, and was pretty good at it. Luckily, I”ve been able to combine both my love for jewely making with my love of teaching – it’s great fun to develop new projects for classes, and very satisfying to see my students create and expand their skills. And I learn from them too, all the time. I have been creating, teaching, and selling for 5 years now, and I still appreciate so much when someone is willing to part with their money, to own one of my pieces, or spend time with me to learn what I have to teach. It is always a thrill for me when I get a new customer or a student, and a real joy whenever a customer or a student returns back for more. People always ask “why do you blog?” For me, this blog is an extension of my teaching and creating. I don’t post that often, but I try to post on topics that people will find interesting, and hopefully useful too. And just like with my customers and students, I get a little thrill every time I get a new reader, or a returning one…! Consignment… the Good, the Bad, and the Very Ugly! Sorry… no photos this time – just an important public announcement! Whenever someone buys one of my pieces, I get a thrill. I admit it – there is something very exciting about having a customer part with their hard earned money to own something I designed and crafted. All of us who sell our creations feel this way – believe me, it’s waaaay too hard to be doing it just for the money!! Most artists and craftsfolks depend on a variety of venues for selling their items. I have my StudioDax Etsy store, and I sell at a few shows during the year, but I’ve made alot of my sales in the past by selling on consignment thru other stores. Consignment can be GREAT! It offers an audience for my jewelry that I probably wouldn’t reach any other way, and it keeps my pieces visible in places where people shop. When consignment goes well, it is a wonderful partnership between the creator, and the seller. By focusing on the creative side, I am able to design more, and improve my techniques. The store takes care of the selling, tax collection, and marketing, and always has a supply of unique items that keeps their shop fresh. Both of us benefit – and the customers do to! But sometimes it doesn’t go so well, and unfortunately, the artist is usually the one who gets impacted for the worse. If the store owner doesn’t have good business sense , or has financial problems, they may not pay for the items that have sold, or may not return the items that don’t sell. Sometimes, they don’t have time to manage their inventory well, or they just don’t care enough, and items get broken or stolen. And in some very troubling cases, store owners are just sleezy, and take advantage of people, with no intent to do the right thing. For these people…. I only hope that Karma wrecks havoc in their life! I have been lucky. I’ve done consignment with 4 stores, and each one has been wonderful, taking care of my pieces, paying me on time, and returning my items when they didn’t sell. But I’ve been reading some disturbing posts about stores that have been contacting Etsy sellers, signing contracts, and the sellers send off their pieces in good faith, only to find out that they’ve been robbed. As a business, as an etsian, as an artisan, and an honest person… these actions both sadden me, and really piss me off. So as a public service announcement, I am posting a link to a website that highlights the financial, moral, and legal issues that some folks have been exposed to, from working with a store called Queen City Emporium in Missouri. I hope that none of my readers have been scammed by them – if you have please make sure to connect with the site author, who is compiling complaints about this store. or…. where the jewelry sleeps! I recently posted about my terribly crowded workbench, and if I wasn’t too embarrassed, I’d show you the other places I’ve been encroaching on to store my supplies, materials, and tools! The dining room has my shipping and packaging area, I keep my photo set-up in my bedroom, and I have various items boxed up in the living room, the laundry room, and the garage. I even have a bench shear on a small workbench which lives in a hallway… the house is taken over!! 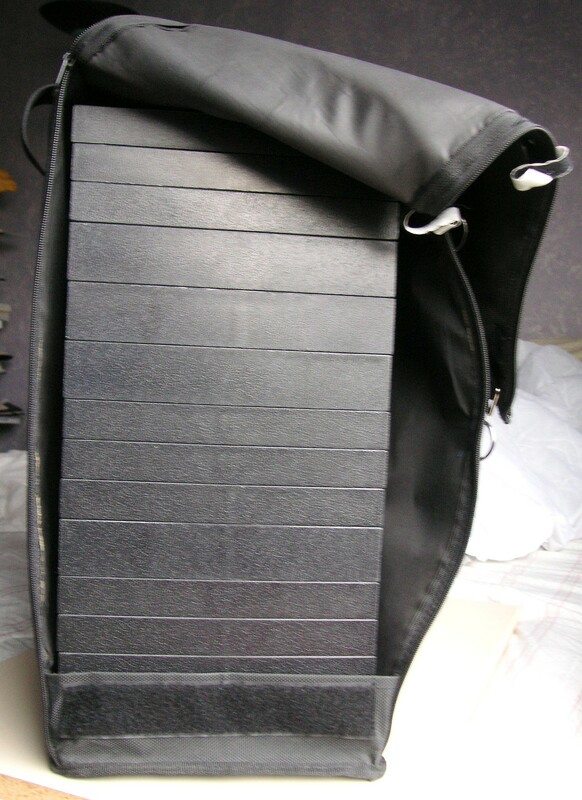 This is a softsided salesman case – the trays inside can vary in depth, and have interchangeable inserts. Most of mine have velvet pads, but I also have some trays with separated compartments, and one has a foam insert for rings. Most of my trays are full sized, but I have a few half sized trays. I like to keep my rings in a smaller tray so that it doesn’t take up much room on my show table – my ring tray has a foam ring insert, and it’s the only one I pull out and leave on the table “as-is” for selling. 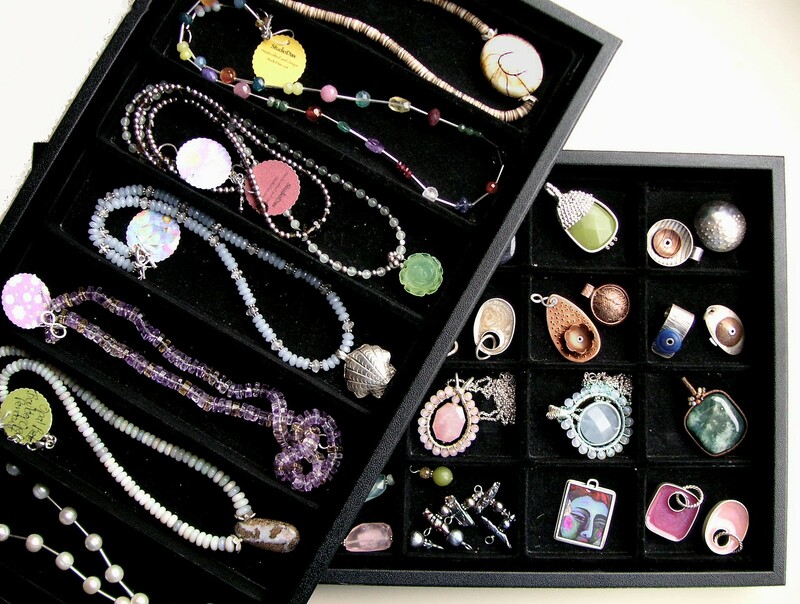 I have a divided tray for the other smaller tray – I currently have a few pendants and bracelets residing in there. Bracelets, Cuffs, and Bangles.... Oh My! It’s not a mess… it just looks like it! 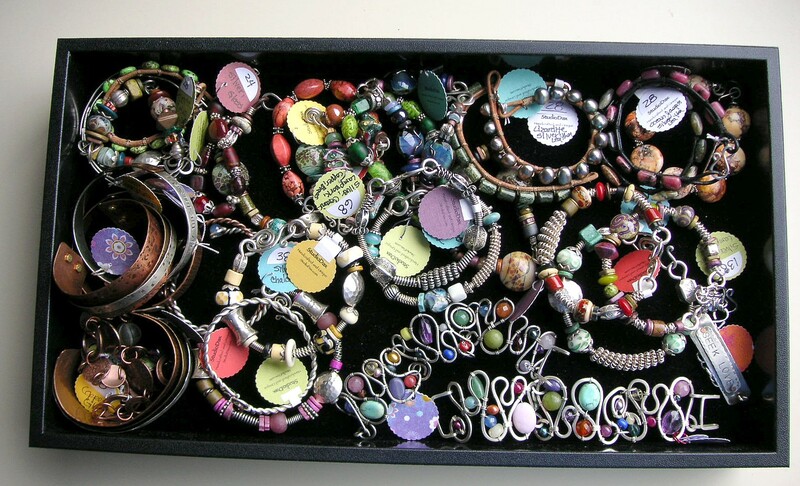 This is a single, deep tray, and most of bracelets “live” here, although I usually store the ones with chains in ziplock bags. I like to work with alot of different things – you’ll find metal work, wirework, bead stringing, and some leatherwork in here! I also have quite a few bead crochet bracelets, but most of them are kept with my teaching materials as samples for classes. 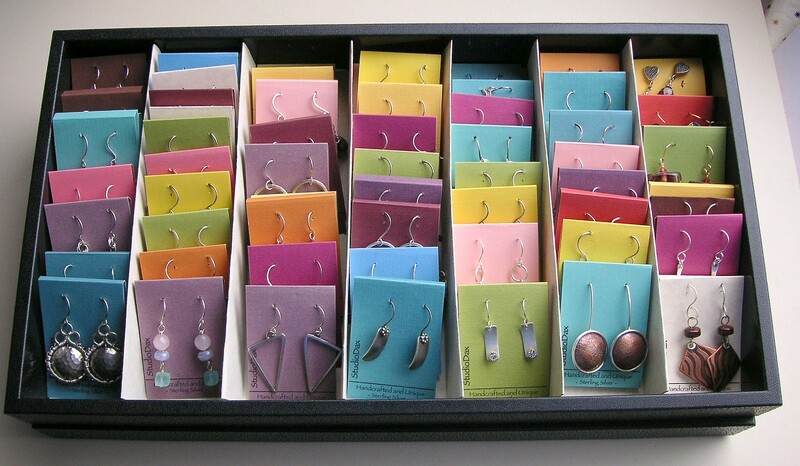 I have ALOT of earrings – and I keep most of them in these 2 inch deep trays. 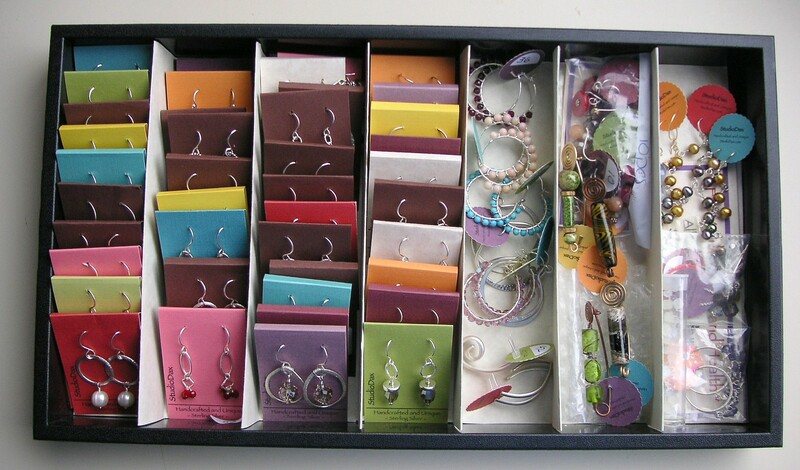 I made the divider inserts with heavy stock, and I’m able to store up to 15 earring cards in each section, or for hoops or dangle styles that I don’t keep on cards. I am always looking for ways to store my chain necklaces w/pendants so that they don’t get all tangled up – placing them all in individual ziplock bags would work, but it takes waaaay too much time to take out and put back for shows.I think my latest method works well – each chain had a tag, and each tag is strung on a hook (see it at the top right side). 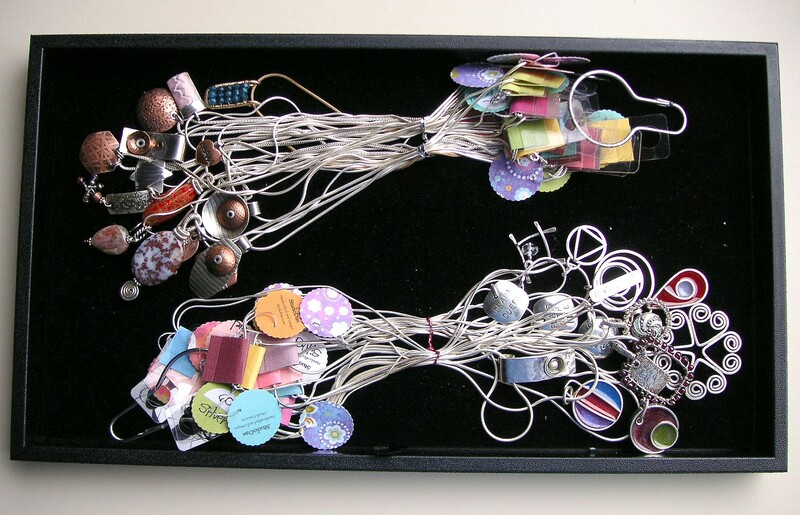 I use twist ties to bundle and keep the chains together, and then store the pendants of each group in a large ziplock (I removed the bags for the photo). To set them out, I just grab the hook, untwist the bundles, and hang them up by the tags. I have 5 trays like this for different styles, but I figure one is sufficient to show you! Everything in it's Own Compartment! 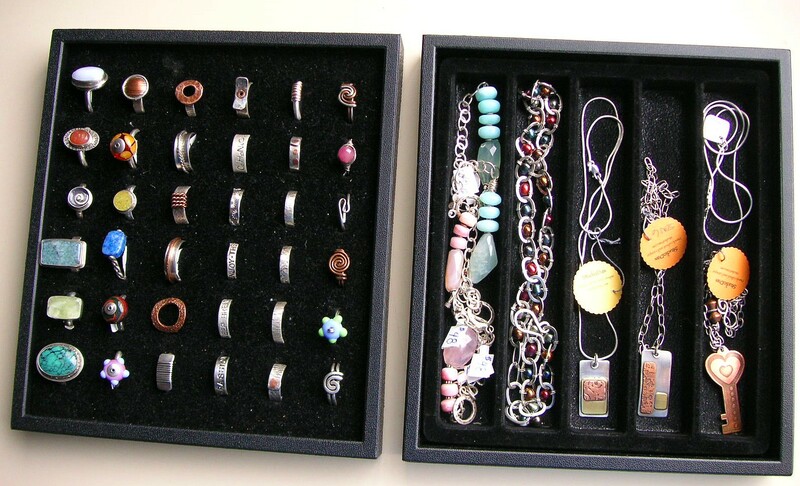 Some trays have specialized compartments that fit inside, and are used to keep items separated – I show here one with a necklace/bracelet insert, and one with small squares that fit standard pre-fab earring cards. I use it instead to hold my extra pendants that are not on chains, or to keep the pendants on very thin chains from getting tangled up. So – this is my method of storing my finished items once they are priced and tagged, which works for transporting items for shows. This is pretty much an industry standard for jewelry, but it took me years of using plastic shoeboxes and ziplock bags before I finally gave-in and purchased this set-up, and I wish I had done it earlier!